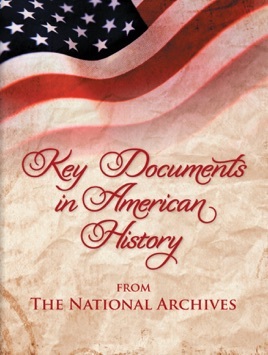 Using the National Archives selection of 100 of America's milestone documents as a starting point--from the Declaration of Independence to the Warren Commission Report; the Dred Scott decision to the Civil Rights Act; Eli Whitney's cotton gin patent to John Glenn's Official Communication with the Command Center--this book adds additional post-1965 records, such as the Pentagon Papers and the 9/11 Commission Report. One hundred eleven of these historic documents are brought together in this original enhanced book, not available in printed form. 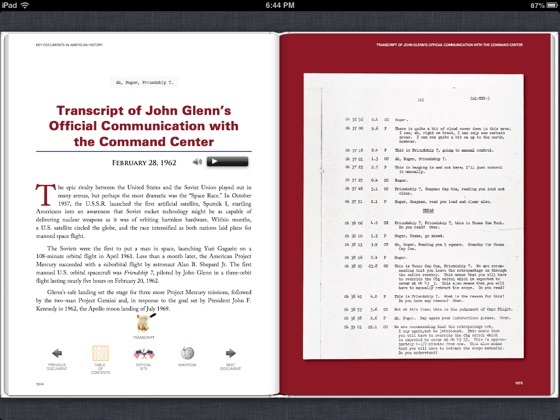 Reproductions of the documents, transcripts, and links to the National Archives official sites for each featured document are accompanied by original introductions by William G. Scheller, along with more than five hours of audio commentary. Links to the complete reports are provided for records that number in the hundreds of pages, such as the Warren Commission Report on the assassination of John F. Kennedy and the Pentagon Papers. 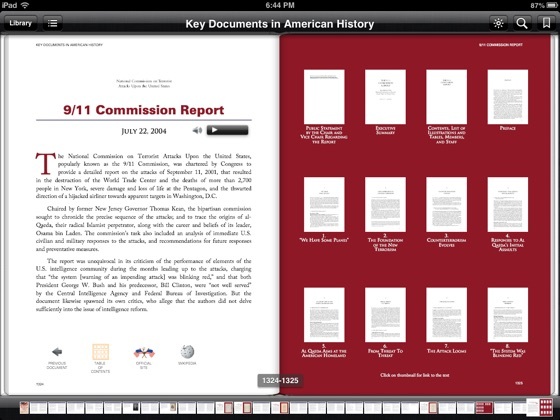 Designed to be intuitively interactive, internal links to the table of contents, transcripts, and other documents provide American history students and enthusiasts with a comprehensive, in-depth look at the documents that reflect the story of America in one easily accessible form. 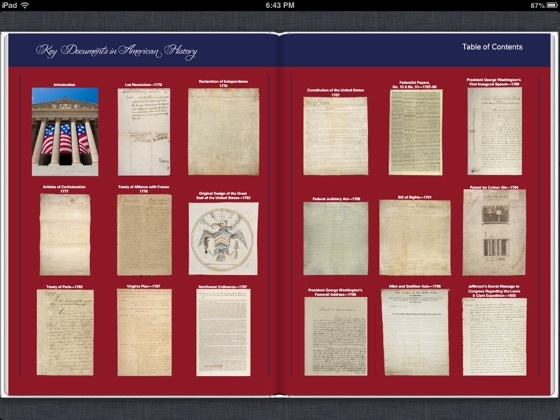 This beautiful and revoltionary i-book appeals to everyone intersted in politics and history by gathering together what are arguably the 100 most important written documents about American government preserved at the National Archives. 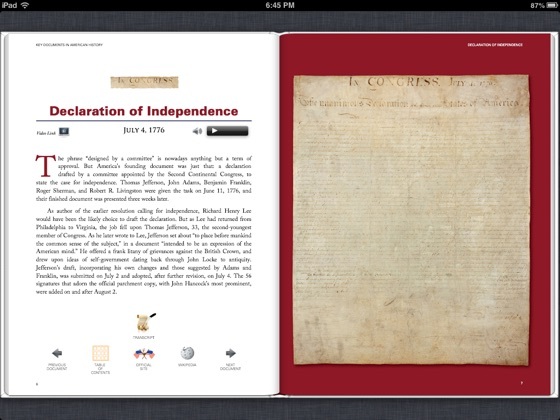 This new i-publication provides ideal access to them: facsimiles of the originals, transcriptions, notes, links to the best supplementary websites and hours of entertaining expert audio commentary by William G. Schiller. Every student needs this i-book as an essential fun tool. Everyone in a discussion about politics needs it for back up. With luck, some day soon there will be publications like this for the key documents related to every government in the world. wow! mesmerizing immersion of American history. i recommend this book not only for the awesome interactive features at the bottom which even include Wikipedia - so you can compare - and I think they only work on the iPad - but the collection is addictive and like stumbling around in a room of ghosts. goosebumps. well done. Great to have all of these documents in one place -- and some I've never seen! Perfect for AP History students, as well as history buffs. What a deal. Also, love the read-aloud feature.